Frances Loring and Florence Wyle were two American-born, impoverished sculptors living in Toronto when the First World War began. 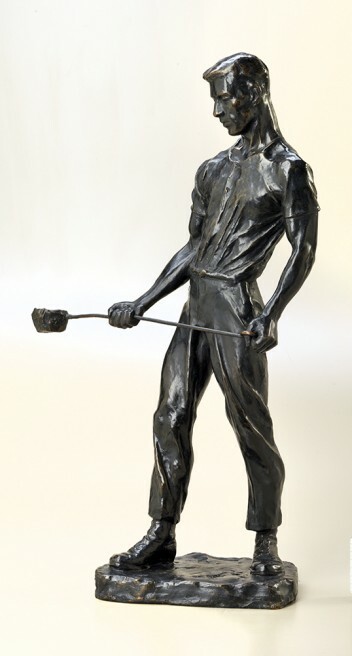 Eric Brown, director of the National Gallery of Canada, commissioned the two women to create sculptures honouring those labouring on the homefront while the country’s young men went overseas to fight. The career of the two sculptors took off. “The First World War was probably the best thing that could have happened to Florence Wyle and Frances Loring,” Elspeth Cameron writes in a joint biography in 2007 of the two women, And Beauty Answers. The two artists created 17 sculptures for Brown. Some were exhibited in Toronto almost a century ago. Some were later shown in the National Gallery. And now, nine of their sculptures have been resurrected from the vaults of the Canadian War Museum to dominate a new exhibition, Ordinary People in Extraordinary Times. The nine bronze sculptures, each about two feet high, sit in the main foyer of the war museum, replacing for almost two years a series of painted portraits of soldiers over the ages. The Wyle and Loring sculptures are like 3-D portraits, mainly of women working in munitions factories. These are women, often dressed in trousers and other male attire, who appear strong, confident and heroic. “They have so much energy,” says Laura Brandon, the museum’s curator of war art. Wyle and Loring are often written out of Canadian art history because they stuck to their neo-classical roots and did not embrace modernism. Along with being artists, the two were early feminists. They believed in equality of the sexes and felt that women could do anything that men could. Those beliefs are reflected in the way they conducted their own lives and in their artwork. The money received for the First World War sculptures allowed the two women to purchase a rural property near Toronto. The home, a former church building on the outskirts of the city, was transformed into a studio where the two artists could be seen often wearing trousers and handling large stone and bronze sculptures that far daintier ladies would never have tried to budge. There has been much speculation over the years as to whether Wyle and Loring were lovers or merely close friends. Acquaintances such as the late Eleanor Milne, the longtime Dominion Sculptor on Parliament Hill, has described the women’s relationship as platonic. Cameron’s detailed biography does not definitively answer the question. Anyway, does it really matter? Wyle and Loring both have work within the collections of the National Gallery and war museum — perhaps the most visible of their work in the city is Loring’s three-metre-high bronze statue of former prime minister Sir Robert Borden on the western slope of Parliament Hill at the corner of Wellington and Bank. The two sculptors, known for years as “The Girls,” met a sad end. Both died in 1968, within three weeks of each other, confused and restrained in separate rooms in a Toronto-area institution for people suffering from dementia. Ordinary People in Extraordinary Times continues at the Canadian War Museum until February, 2017. This worker stands ready to pour molten iron into a mould. Wartime shells and domestic tools — as well as this bronze statue — were made in moulds. By emphasizing the figure’s powerful stance, Canadian sculptor Florence Wyle captures the strength required to do this kind of work. Notice the way the ladle bends under the weight of the liquefied iron. This sculpture shows a woman carefully balancing two shells, one on each shoulder. Handling explosives was dangerous work. A dropped shell or a wayward spark could mean disaster for a munitions factory and its workers.